2018 Leaf History of Baseball Cut Signature Edition delivers exactly what it promises. Celebrating some of the top players of past and present, and even a few surprises, each box yields a cut signature card that has been encased. Just as in the 2017 version, all-time greats in the Hall of Fame are again in play, like Ruth, Mantle, DiMaggio and Cobb. 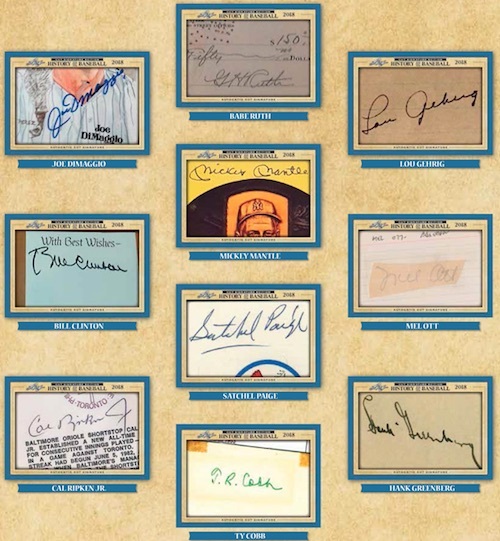 The 2018 Leaf History of Baseball Cut Signature Edition checklist also features players that should be in Cooperstown, as well as current baseball stars. New this year are some of the notable subjects to have thrown out a ceremonial first pitch. 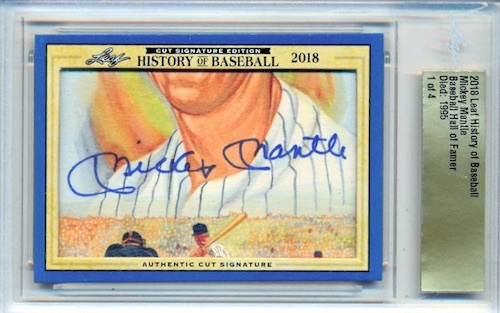 These cut signatures may not be as directly related to baseball as the MLB greats, but it gives Leaf a wide range of interesting options to include in the release. Although not many details were provided, former president Bill Clinton, who threw out the first pitch on MLB Opening Day several times as president, is among the teased names and mock-up images. 2018 Leaf History of Baseball Cut Signature Edition includes one card per box and 20 boxes per case. The tentative list of signers is provided on the tab above. This is a preliminary checklist and subject to change. Many other names are included. Buy cards on eBay. What a crap product. $35 for a single card, and judging by what is on ebay, a giant hodge podge of hot garbage. Apparently, Leaf went to the trouble of getting deceased Gary Caters’ old financial records, then cut out his signature from every check he’s ever written in his life. Awesome product.. I’m going to get a few cases, hoping for the Ruth !!! Since when is Bill Clinton one of the “Best names in the sport????? Kinda cool product, I will probably end up buying more in time. I couldn’t help myself and bought 2 more today. It’s weird that I want to own random signatures from players of long ago, but I do. Even if it is on a cheque (Hoyt, Perry and Palmer) or just a piece of paper (Tramell and Ichiro).